A Feud Between The Kingdom's Heirs, A Battle Won By Magic And A Massacre That Stained The Battlements Of Castle Wulf Red With Blood. The Bitmap Brothers is one of those companies that their sole mention forces you to stand up and solemnly put a hand on your chest. I mean, where to begin? Xenon? Speedball? The Chaos Engine?! Gods??!! Based in the UK, they were the rock stars of the golden age of computer gaming: a cool and hippy company that couldn’t release a bad title even if they tried to (hey, even Magic Pockets was good!). Most of their games have indeed become staples in gaming history but one of their most unique achievements regrettably remains overlooked to this day. 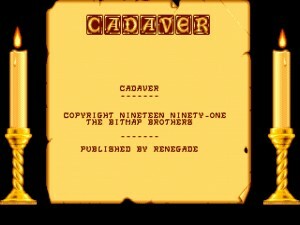 And it is my job as the caretaker of this blog to let you know about it: this is Cadaver, and it’s definitely one of the coolest names ever conceived in videogames. 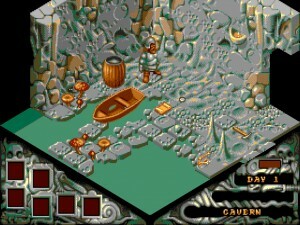 The game casts you as Karadoc, an odd-looking dwarf in a quest to infiltrate a dangerous castle and kill an evil necromancer (Dianos) who has been causing mischief and deserves a spanking. Who cares really, the story is very secondary, although The Payoff (an expansion pack with a limited release) was a bit more elaborated in this regard. The basic idea in Cadaver is to find your way into Dianos’ sanctum and obliterate him. 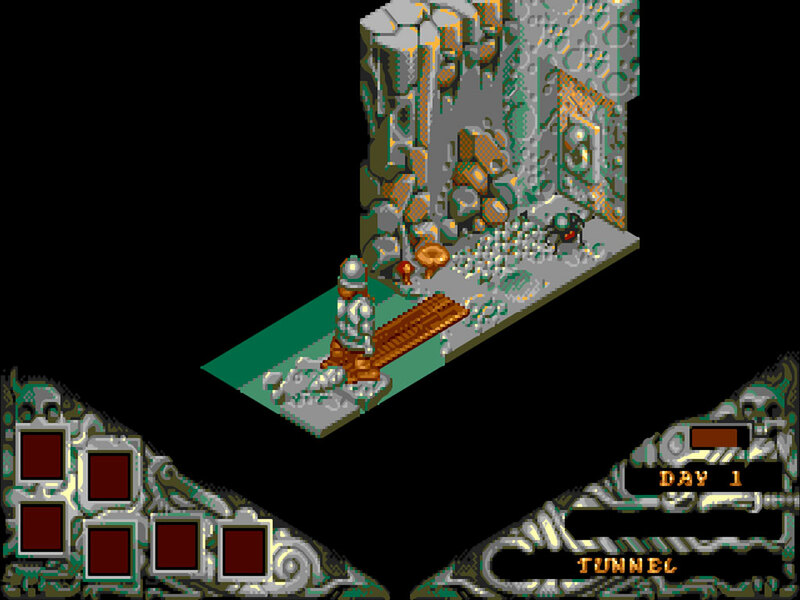 Karadoc will have to explore sewers, dungeons and many royal chambers of the castle. We’re talking about several hundred rooms here, making the whole play quite extensive. 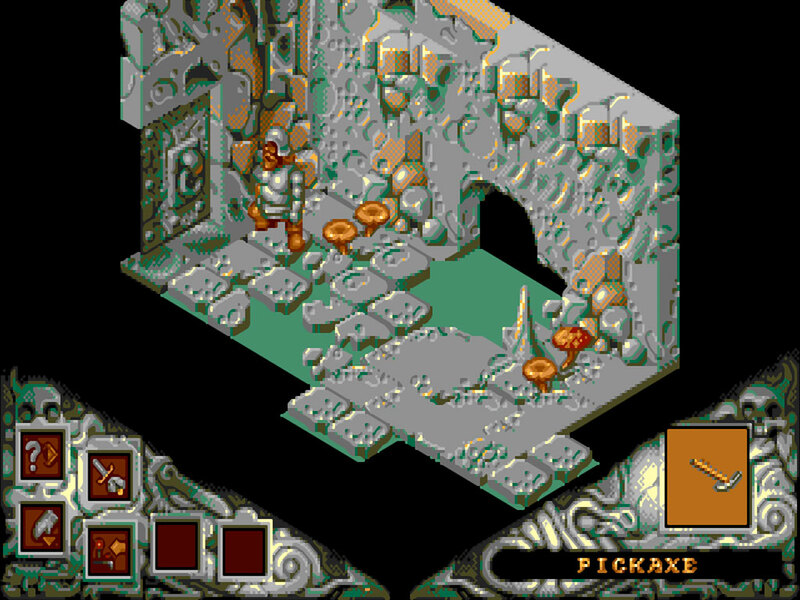 The game exhibits the characteristic graphical style from Bitmap Bros. which became famous (and unmatched to this day) with Speedball, sort of like heavily glossy cartoons, all in glorious isometric perspective. Did I mention just how much I love the isometric perspective? If you want to know, you should read my write-ups of D/Generation and The Immortal. This is my third isometric pick yet and there’s more to come. 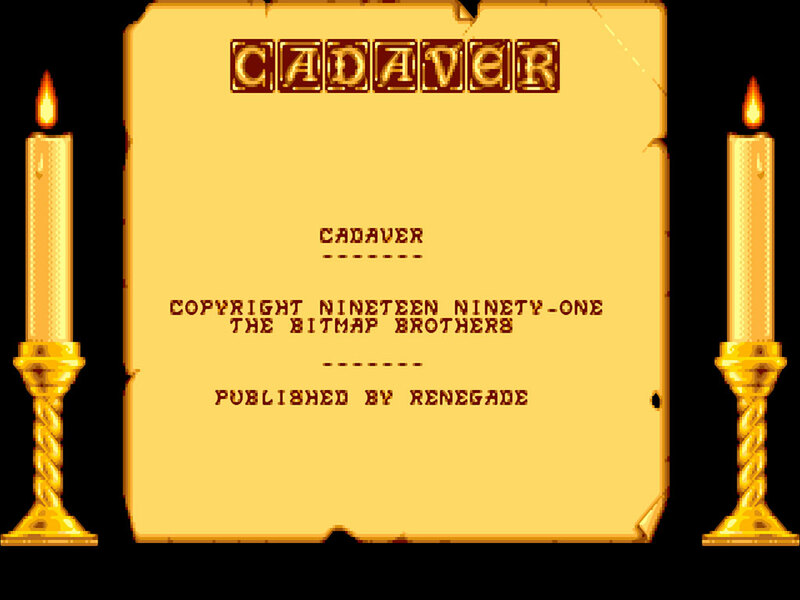 Cadaver is, first and foremost, a very lighthearted RPG. It’s practically a classic adventure really because you don’t have to worry about stats, there are no NPCs to interact with, battles (if you can call them that) are minimal and the gameplay mostly relies on puzzle solving. And these are some pretty devious puzzles too which ranges from standard use-item-on-item to sorting out complex mechanisms that require your utmost concentration. One recursive puzzle is the necessity to stack up all kinds of objects (boxes, bones, rocks, junk) to reach higher places. In fact, the engine behind Cadaver is quite versatile, allowing you to move most objects and perform many actions with them. 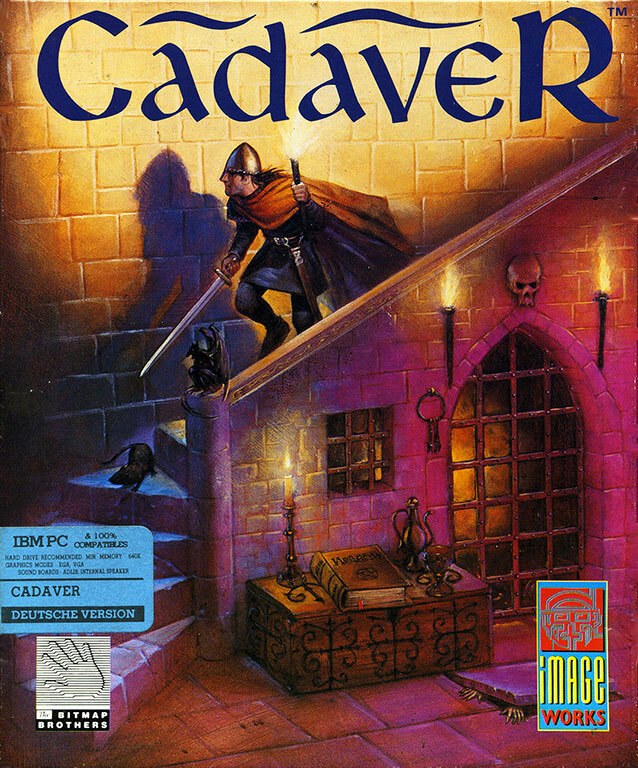 This gives the gameworld a very lively and dynamic feel, as well as making Cadaver quite possibly one of the most complex pure isometric games to date. Even so, the whole experience is incredibly addictive and you find yourself always looking forward to see what secrets has the next room in store for you. Add to this countless of loot, many hidden things, multiple solutions to puzzles, a rocking soundtrack (the best tune from Bitmap Bros in my opinion) and you got yourself a truly legendary title. Not to be missed. We really couldn’t agree more Agustin. 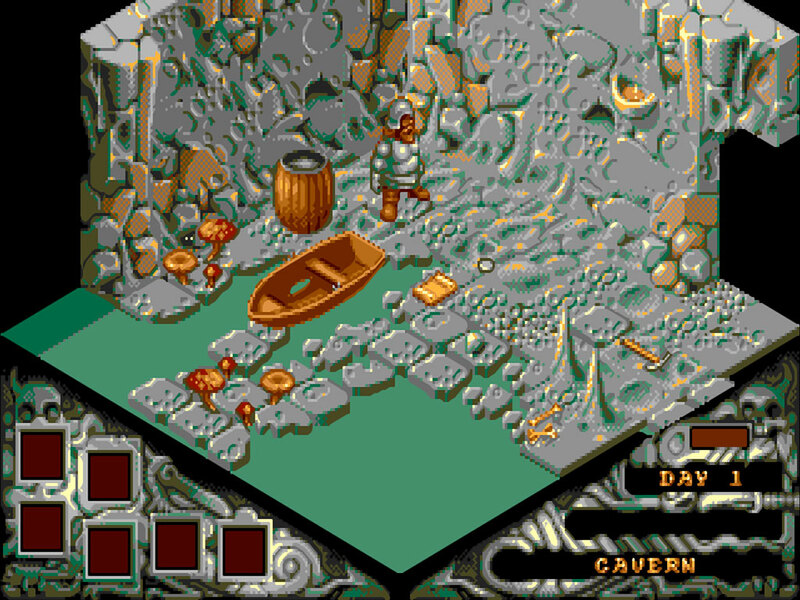 Cadaver is a fantastic game and the Bitmap Brothers were 16-bit gods, which reminds me that Gods was rather good too. Anyway. 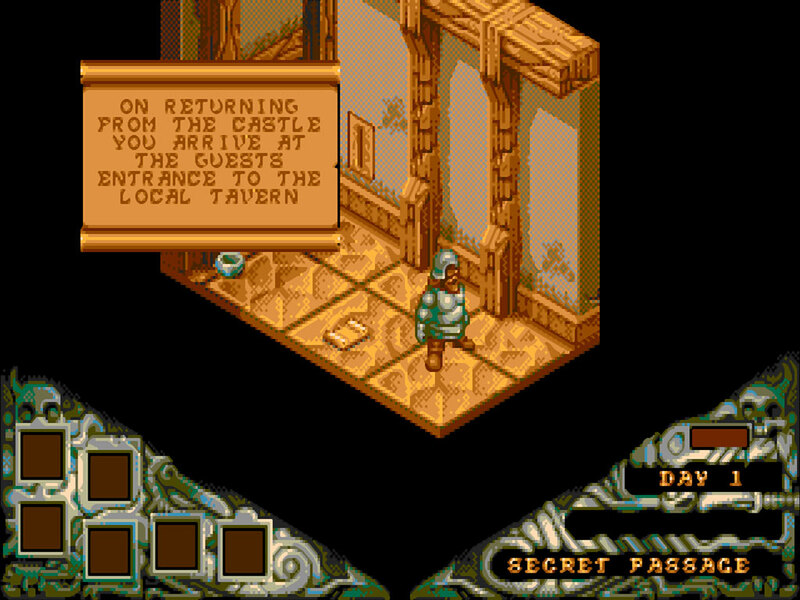 Thing is I really miss this kind of adventure and definitely the isometric perspective. Remember Robin Hood? This probably isn’t the first game you think of upon the mention of ‘Bitmap Brothers’ but it is a scorcher. 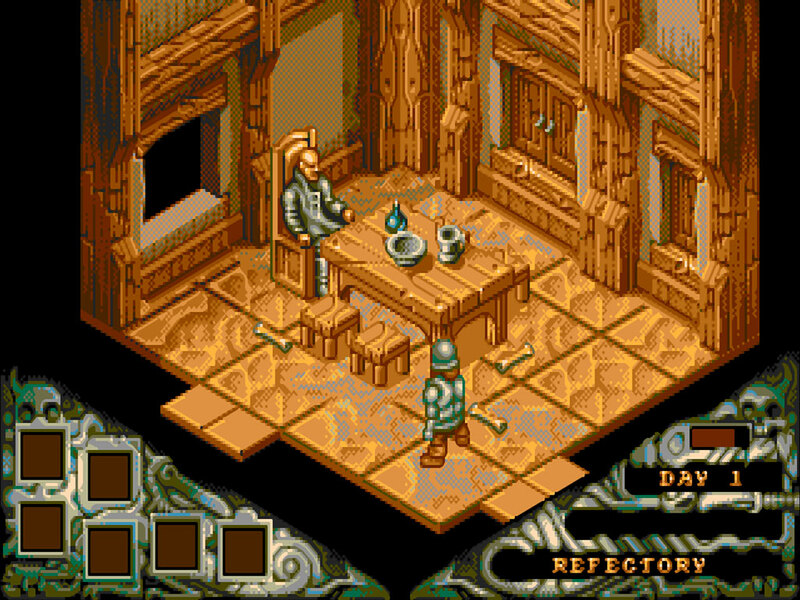 I had a demo of this on the Atari ST back in the early nineties, but I only played it once or twice as it scared me witless. I remember being locked in a bedroom being slowly poisoned by gas seeping in through holes in the walls. Terrifying stuff. The demo was on the cover disk of Zero Magazine, my favourite magazine at the time, and I think they released a couple of different Cadaver demos, at least one of which was an exclusive level not in the commercial release. That may be worth tracking down if you’re a fan. Great post, by the way – subscribed! Yea, this game rocked. I got the PC Shareware version first and rode it to death. I only got to play the full version years later – no internet back in that period. And Bitmap Brothers do rock! Thanks all for the great comments! I guess I have to seek out those shareware disks if they included exclusive stuff… I don’t think I remember any room with poisoned gas. @Gnome Never played Robin Hood but thanks for reminding me of it! There just wasn’t enough isometric games past the ZX era. We’ll agree to disagree about ‘Magic Pockets’. As for ‘Cadaver’, I love it as well and played it loooooaads in the ’90s. I managed to get quite far up the tower (as the bishop said to the actress) and managed to reach a level that was all plush furnishings and carpets and stuff. Never got past that and have long since lost my save disk, sadly.